Home Address: ______________________________ ___________________________________________ No. & Street Apt. include: • Scales (as listed below) • Sight reading • A section of a prepared piece (1-2 minutes in length) of the student’s choice which best represents their playing level. This program is sponsored by a grant from the Louisiana Division Recreation and Tourism, in cooperation with the Louisiana State Arts Council. The grant is administered through the Arts Council of New Orleans. MUSICIANS OF TOMORROW ... TODAY! el AME itorium. the June church. 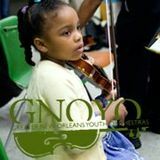 Greater New Orleans Youth Orchestras Now in its 25th season, the Greater New Orleans Youth Orchestras (GNOYO) is an independent engage,educate, and foster music awareness across the community. 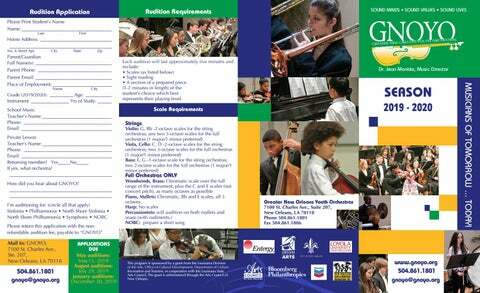 Young musicians, ages 7 to 19, are placed by audition in GNOYO’s challenging and rewarding orchestral programs. Five orchestras and three outreach programs are offered: • Symphony • Philharmonia and North Shore Philharmonia • Sinfonia and North Shore Sinfonia • NOBC - New Orleans Boys’ Choir • Young Artist Academy • Chamber Music Groups • Endangered Instruments Program Each season, GNOYO also presents an annual Young Soloists Concerto Competition, three major performances, community outreach concerts, improve individual performances and ensemble skills, while developing the attitudes and discipline that help them take initiative in their schools and community. Recent seasons have included an East Coast concert tour, concerts at Carnegie Hall, and collaborations with the Louisiana Philharmonic Orchestra and the New Orleans Ballet Association. Monday, June 22 All aboard! And we’re off! Two buses turning the corner from Calhoun on to Charles Ave. 1st stop: Charleston, GNOYO is St. the proud recipient of the S.C.
GNOYO is structured to include players at all levels of ability. There are three divisions: • Sinfonia/North Shore Sinfonia • Philharmonia/North Shore Philharmonia • Symphony Beginner to intermediate string players will be placed in the Sinfonia. Intermediate string, woodwind, brass and percussion players will be placed in the Philharmonia. Advanced and precollege players will be placed in the Symphony. Please arrive at least 30 minutes to an hour before your appointed time. Although regular auditions occur in May, August, or January, GNOYO also conducts rolling auditions throughout the season. audition application or go online to: www.gnoyo. Philharmonia/North Shore Philharmonia orchestra players should have experience playing scales and repertoire in keys containing up to players must display an intermediate level of String players must be able to play in the third vibrato and a variety of bow articulations. Harpist or percussionists with a piano background are preferred. Symphony students should have experience playing scales and repertoire in all keys. Woodwind and brass players must demonstrate advanced accuracy of scales, clef-reading and transpositions, where applicable. String players three octaves and meet a minimum ability to play .